Given that sandtimers are widely considered to have been invented in medieval Europe, there is no better creature to add to on than the medieval dragon! 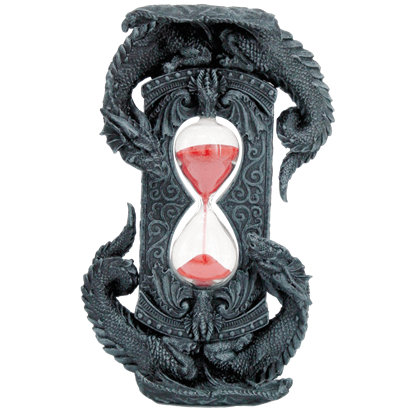 We offer a selection of dragon sandtimers here that are quite the sight to behold, combining the typical form of an hourglass with the stunning look of a dragon. All of these hourglasses are functional, containing material enough to time out various lengths of time. Some of our sand timers are free-standing decorations with two bases, which are physically flipped over to start the timer, while others are rotating sand timers that have a permanent base and feature a rotating hourglass. Our sandtimers run for varying amounts of time, as some are larger and have narrower passages than others, making them great for timing various activities, as well as a great visual decoration to just flip over every now and then. Some are even great for timed games of chess and checkers! 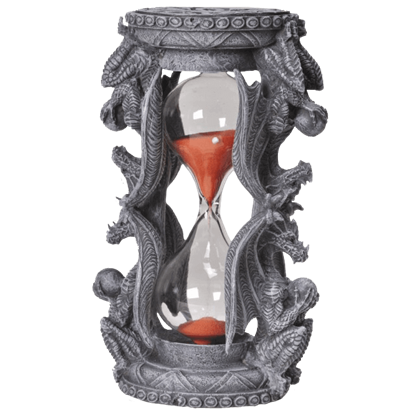 Given the combination of medieval and fantasy, many of the dragon sand timers you will find here are quite the sight to see, serving not only as great little time pieces but also as fantastic decorations that are sure to hold the attention of all who see them. Time is a precious commodity, as once you have used it all up, there is no way to get more. Luckily, this Celtic Dragon Sandtimer is a way to tell if you are running out so you can give yourself a little more by flipping it over. As ancient beings that can live for eons, dragons make a suitable representative to symbolize the passing of time. The Double Dragons Sandtimer features a pair of dragons curled opposite each other around a sandtimer. The Dragon Sand Timer is the perfect way to measure our short stints of time. 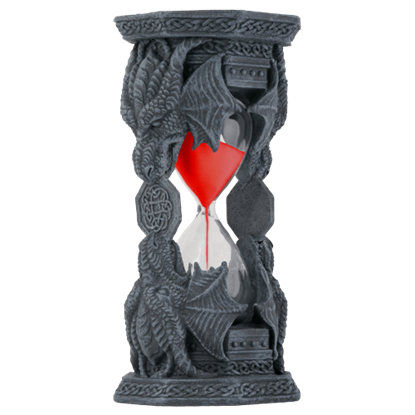 Not only is it a functional hourglass, but it is an incredibly eye-catching piece that features an attractive, fantasy based appearance. 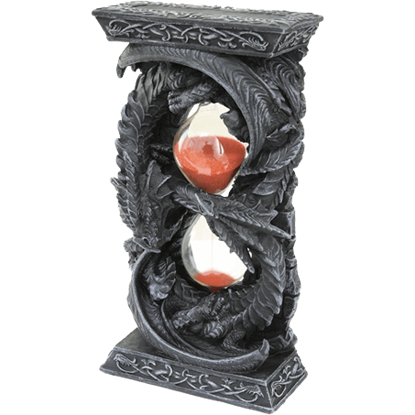 The Dueling Dragon Sandtimer offers draconic style with a dark touch to home or office decor. 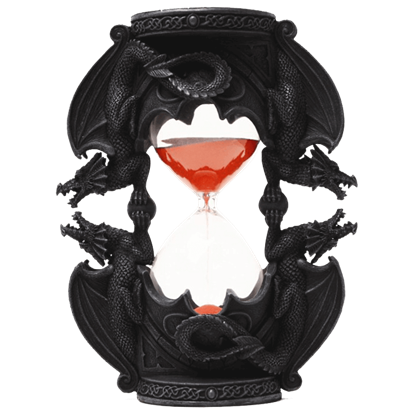 Made of high quality cold cast resin, this functional fantasy sand timer features four fearsome dragons framing its sand-filled glass. 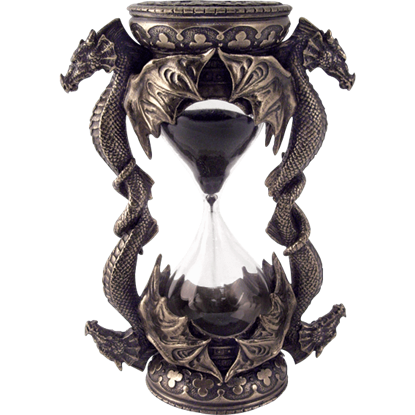 The image of a dragon has withstood the test of time, and this unique hourglass features one on all sides. Our Encapsulated By Dragons Sand Timer displays four dragons coated in a bronze finish alongside a glass timer filled with colored sand. Dragons are patient creatures. Possessed of incredibly long lives, most are content to simply wait out the sands of time, when necessary. Wait they do, in the form of this Twin Dragon Sand Timer, which you can use as decoration.